As we noted in the v6.1 Release Notes, this coming release features an update to the Alliance Mission Rank and Milestone rewards, as well as the Shattered Lands and Ancient Sanctum Map Crystals! These updates will make higher level Rank Up Materials more accessible to all Commanders that take part in Alliance Missions! Rank Rewards have been increased across the Board! Milestone Rewards amounts have been increased, giving you access to a full Tier 2 Alpha Spark, Tier 3 Basic Sparks, and Tier 1 Alpha Sparks! We’ve also taken this opportunity to create some new Shattered Lands and Ancient Sanctum Map Crystals! These new crystals are not retroactive, so any old Crystals that you have saved will not be updated. They also use the new “Ancient Sanctum 2.0” and “Shattered Lands 2.0” crystal shards, so old shards cannot be used to open these new crystals. 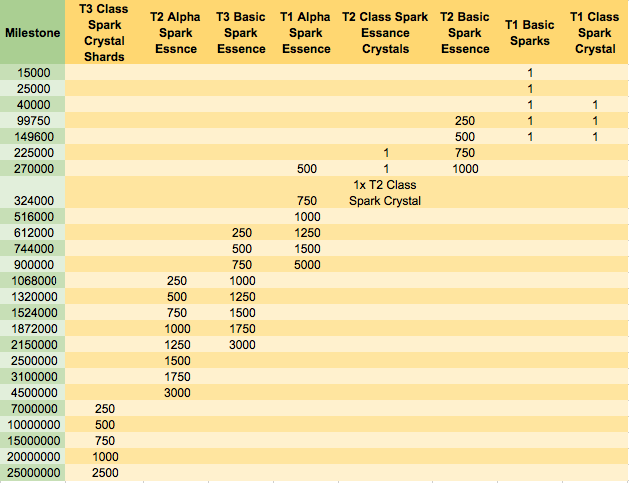 We’ve removed some of the lower tier rewards, and bumped up amounts of rarer Spark Essences! Goodbye Tier 2 Alliance Missions Repair and Revive Kits, hello Tier 3 Alliance Mission Repair and Revive Kits! These new Rank Rewards, Milestones and Map Crystals will be available when the next series of Alliance Missions kick off on May 3rd! We’ve also got some more information on updates to our Daily, 4 Hour, and Alliance Crystals coming your way! So stay tuned!